INSIDE : See easy step by step instructions to create inexpensive wall art. 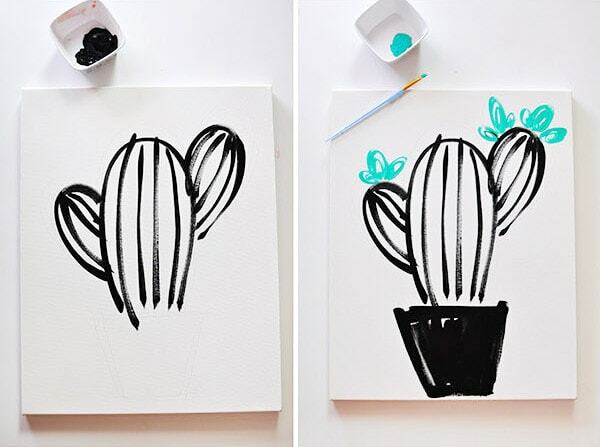 Tips on how to draw or paint a simple Succulent drawing or even a cactus in just a few simple steps! You can become your very own artist. 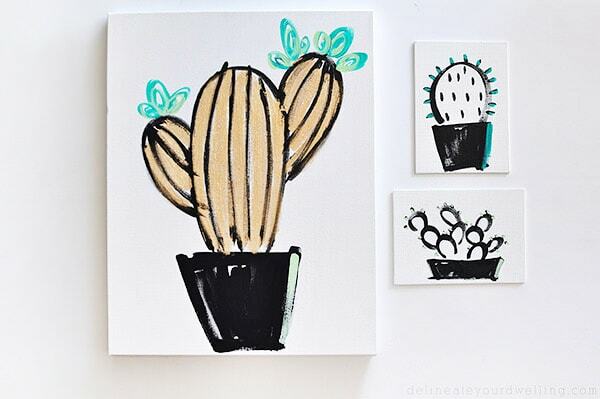 Today I am sharing my Easy Art in 1.2.3 : Simple Succulent wall art tutorial. 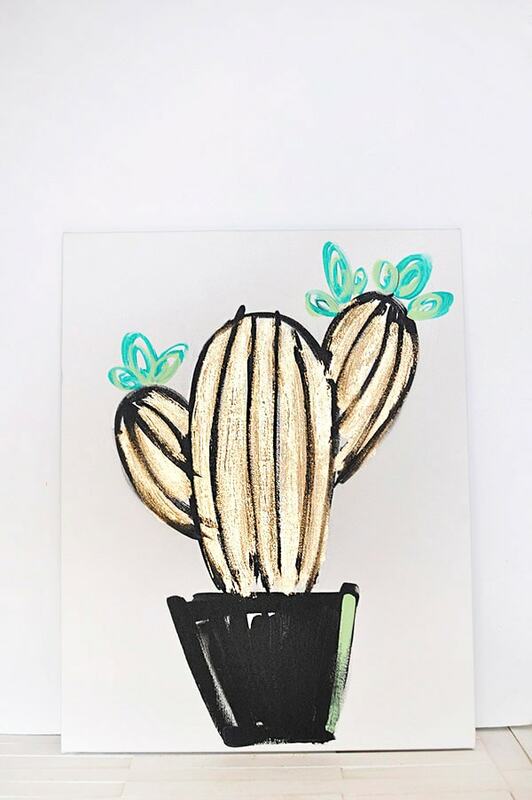 I love sharing step by step instructions on how to draw and paint small succulent plants and cactus, so that you can make your own inexpensive art work. So often finding art work that you love for your home can be quite expensive, but guess what… it really does not have to cost much at all! Let’s go ahead and talk about what we need to get started. Today is the fourth post in this mini series of Easy Art. 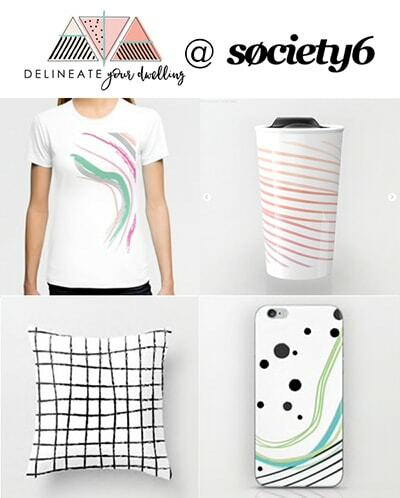 I have had such a fun time creating all kinds of different and new art work! So far, I have made Abstract Diamonds, Diamond Patterns and A Geometric Peach. And you all have LOVED this tutorial SO MUCH… that I made a Tips to draw and paint a colorful pumpkin, too! 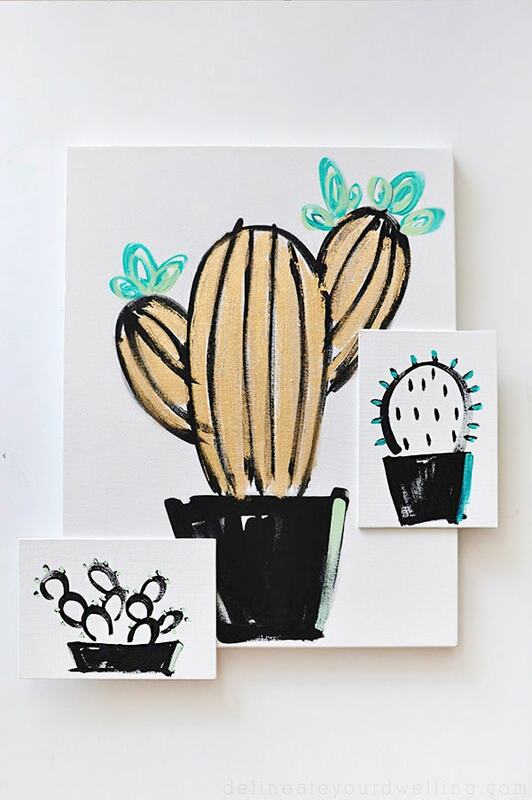 What supplies do I need to draw a Succulent and make Cactus Wall Art? 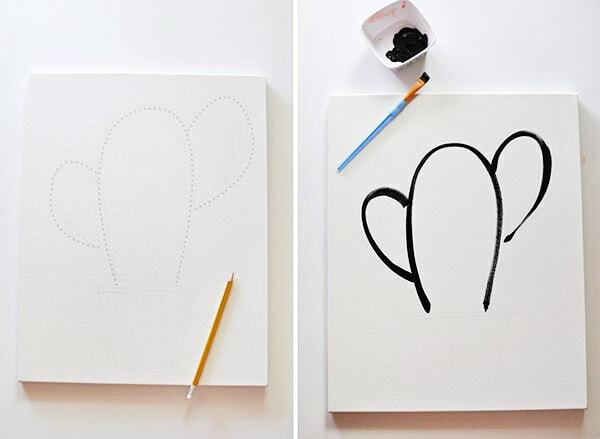 Next, load up your brush with black paint and trace the cactus / succulent pencil lines. If you can do this with one single smooth line, it’s best. Just go with big arching lines. Next, added painted lines to the interior of your cactus / succulent. Then, create the pot for your plant with a basic pot shape. I was going for a very simplified look on this piece of DIY art work, so the less tinkering with and worrying about perfection, the better. Then using your two different shades of green, you can add in the cactus painted flowers. 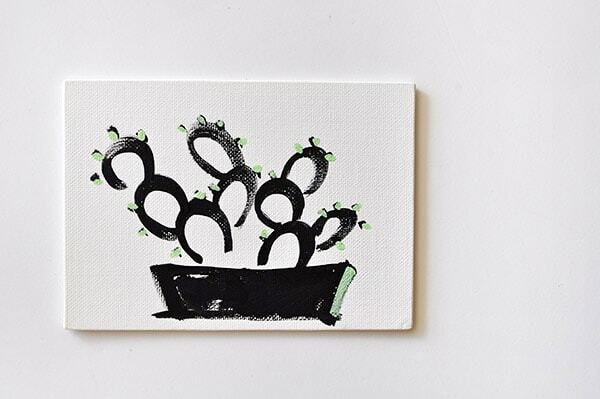 If you are wanting to stick with this gorgeous black and white succulent drawing, it would still look amazing just as is. 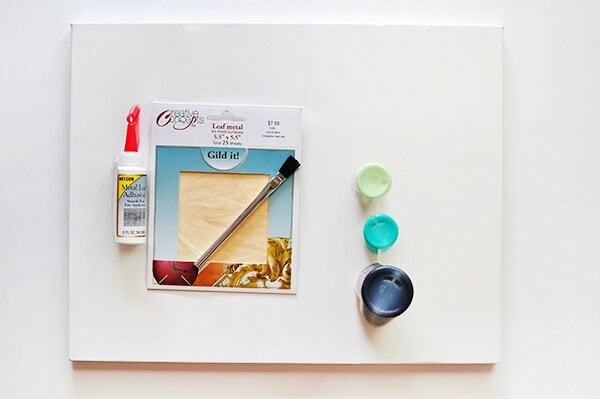 For a final touch, it is time to add in the gold foil to your Painted Succulent piece of art. Brush on thin lines of metal adhesive glue in between your cactus lines. Allow the glue to dry until it has a slightly tacky feel – follow the directions on your glue for the exact dry time. Then, you can apply your gold foil sheets to cover. Brush off any excess gold leaf with a clean brush or towel and enjoy! Note: The gold leaf goes everywhere, so be sure to brush it off near a trashcan or even outside. 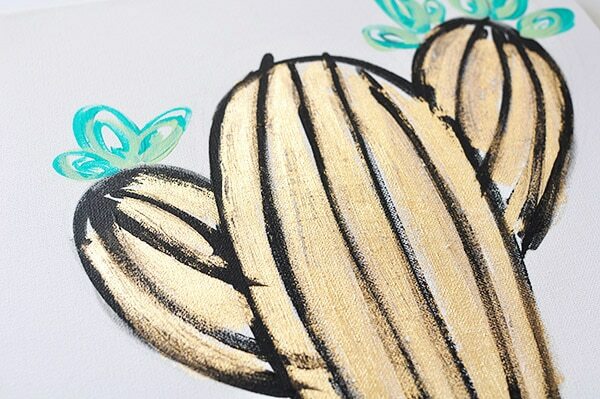 The final product is this beautiful gold glimmering DIY Cactus painted piece of art work! I love the modern vibe it gives off and I decided I wanted to create a few smaller succulent paintings to go with it. This is such a fun pair of painted succulents and they have looked amazing displayed on my fireplace mantel. 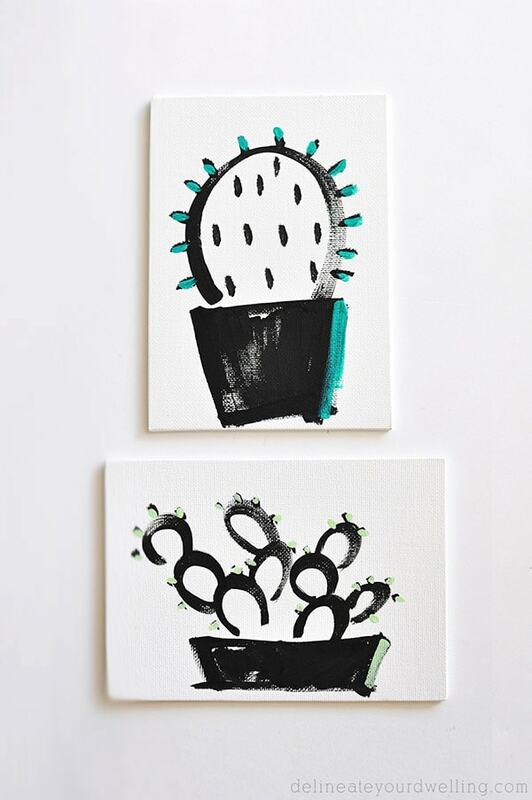 I painted a simple black and white barrel cactus and an adorable prickly pear on two smaller canvas’. I’m taking requests for next month so be sure to comment below with your favorite paint medium or one you’d like to see me try! Yay! Share a pic with me and I’ll post it on my monthly newsletter and a link back to you! Thanks for sharing at the party! Pinned & shared. I love using faux gold leaf and gold leaf in projects. Cute cacti. 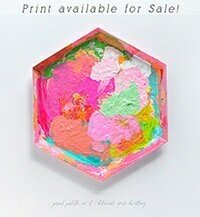 This looks like a cute and simple art project. 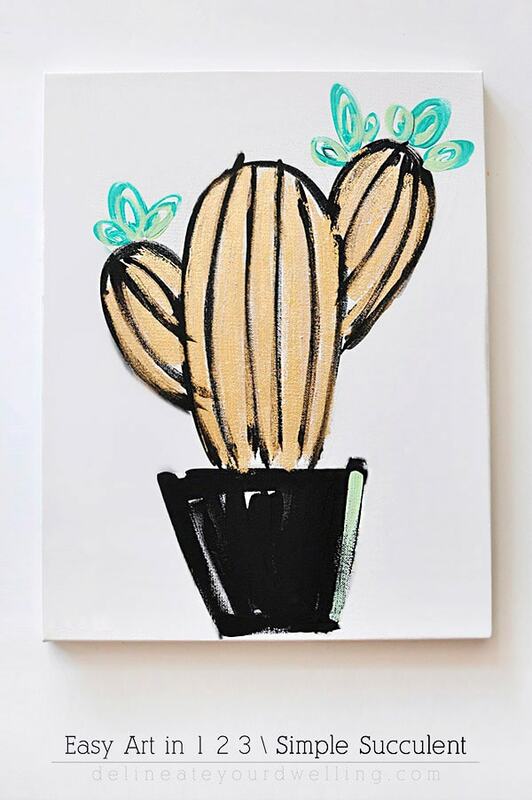 I’m really loving the cactus trend right now so this would be a fun addition to my wall. This is sooo cute! I can’t wait to try this! Some friends and I get together every few weeks to try a craft we’ve seen online, and I want to try this one the next time we get together. Pinning this! sooooo cute Amy!!! LOVE them!